I’m sounding like a broken record, but economic journalists are doing the U.S. a grave disservice by repeatedly overstating the importance of consumer spending to domestic economic production (which, after all, is what generates jobs). By persisting in this fallacy, journalists also understate the importance of investment, exports, and government spending. Wrong. That’s just so wrong. The number, 70 percent, comes from an apparently simple calculation of consumer spending as a share of gross domestic product (GDP). But it’s a wrong calculation. Much of what consumers buy is imported–just step into your local store, friends, and take a look at where it was made. In fact, any economic reporter who writes the sentence “consumer spending is 70% of the U.S. economy’ should be required to calculate how much of their household spending goes for foreign-made goods (hint–take a look at your computer, your dishes, your phone, your clothes, your kids’ toys). Higher consumer spending need not be accompanied by higher domestic production, or by increased domestic jobs, since the higher demand can be filled by imports. 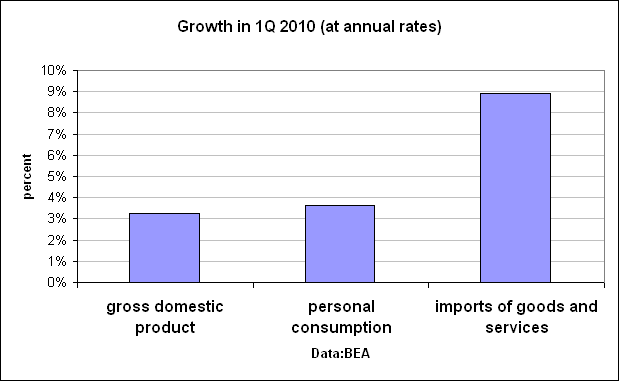 In the first quarter of 2010, imports of goods and services rose much faster than domestic production, in real terms. So if consumer spending is not 70% of the economy, how big is it really? I’ve estimated that ‘pocketbook spending’ really makes up 40-45% of economic activity. I’ve written about that here and here. There’s another point as well. Much of consumer spending is ‘induced’ by other changes in the economy–for example, a company gets a new order from overseas, and in response expands its factory and hires more workers. These newly-employed workers go out and spend which shows up as consumption. Should we say that this economic growth is being driven by PCE, or by exports? Or the government steps up its spending on highways, which results in the hiring of more construction workers and more consumer spending. Should we say that consumer spending is driving the economy, or is it the increased government spending? In a paper they presented at the 2009 Federal Forecasters Conference, BLS economists Carl Chentrens and Arthur Andreassen (retired) analyzed the impact of imports and what they call ‘induced consumption’. They point out that the way GDP is reported, the personal consumption category is being given some of the credit for growth that should actually go to government, investment, and exports. The chart below shows what they found. By their calculations, personal consumer expenditures should properly be given credit for 46% of economic activity, rather than 70%. The government share goes up from 20% to 25%. These are not abstract calculations. Everytime a journalist says that consumer spending is 70% of the economy, he or she perpetuates the falsehood that the U.S. cannot grow without increased consumer spending. It’s far more accurate to say that the U.S. needs to grow as much as possible without increased consumer spending if we are to prosper in the future. « Is Trade a Plus or Minus for U.S. Growth? Consumer spending may make up 70% of consumption, but it actually accounts for zero percent of GDP. 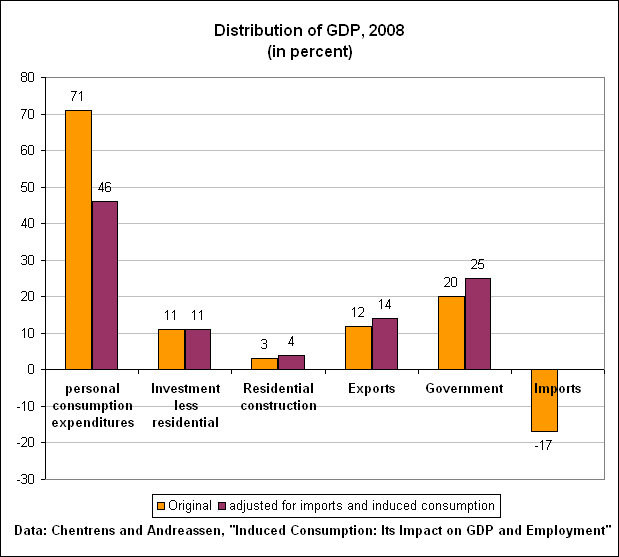 the change in trade and inventories to indirectly estimate output or GDP. GDP is production and consumer produce nothing. The message is worth repeating, and repeating. I read your more in depth article regarding PCE on BusinessWeek. Your logic behind backing out costs for various services and discounting the value of imported goods is spot on. I’m wondering, however, why you would back certain figures out of PCE (the numerator) but not GDP (the denominator). Specifically, you start with the PCE:GDP ratio of 10:14, or 70%. You then back out 4.5 from PCE to get a revised value of 5.5. Should you not also reduce GDP by 4.5 as well? Doing so would result in a ratio of 5.5 : 9.5, or 58%. Mr. Blankfein testified about investment and trading activities of Goldman Sachs and other investment banks involving residential mortgage based securities and related products. Ben Bernake sure feels consumer spending is very important to the economy. No doubt, with it making up nearly half (46% as stated above) the US economic activity. The person doing the largest disservice to the US is Ben Bernake with his policy to print money to infinity and beyond. No one wants to talk about the 85 Billion per month being printed by the Fed, and what printing money inevitably leads to. Good luck my American friends. The end IS near. Consumer spending, nationally and Internationally, counts for 100% of World economic activity and, by inference, 100% of World GDP. If all consumers stopped spending all components of the GDP of every country would go to $0 within a short period of time. Business would have no capital to invest and governments would have no tax revenue to re-allocate. The items we consumers spend on and the items we approve for our government to spend on determine which investments and exports are profitable for businesses.